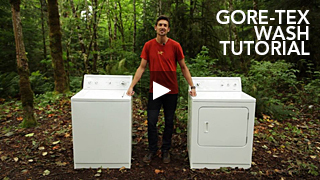 Learn how to care for our GORE-TEX products and treat them with DWR. Routine care and maintenance is critical for the optimum performance of your Arc'teryx GORE-TEX® garment. Dirt buildup and body oils from sweat can compromise the membrane and overall effectiveness of the textile’s Durable Water Repellent (DWR) treatment. DWR encourages water to roll off the surface –this is called ‘beading’. Regularly washing and re-applying DWR will restore the performance and extend the lifespan of your GORE-TEX garment. Use your best judgment. If your garment looks dirty, or is no longer beading water, it is time to give it a wash.
Close the main and pit zippers. Open pocket zippers. Release tension on all elastic drawcords. Loosen and secure the cuff Velcro®. Put your garment in the machine and add cleaning agent. Wash on medium heat (40°C/104°F) at regular cycle setting. It is advised to use a second rinse cycle to remove any residual soap which will compromise DWR and garment performance. If your garment is no longer beading water, it is time to re-apply DWR. Remove your garment from the machine and shake off excess water. Close all zippers. Hang the damp garment and spray DWR on the face fabric, concentrating on high-wear areas. Before drying, turn the garment inside out for maximum uptake by the face fabric. Place your damp garment in the dryer on medium heat for 40 to 50 minutes (or until dry to the touch) to effectively activate DWR. You may also use a liquid free-rinsing soap or gentle detergent. Avoid detergents that contain fabric softeners, fragrance, whiteners or colorants. We recommend to double rinse in order to remove any residue. To prepare the garment for washing; close the main zippers and pit zips, open pocket zippers, and release tension on all elastic draw cords. Add cleaning agent to the machine and wash the garment on a medium heat setting (40°C / 104°F). Remove the garment, shake to remove excess water and place it in the dryer. DWR is reactivated best when tumble dried at a medium heat setting (40°C / 104°F) for 40 to 50 minutes. DWR is a polymer coating which increases surface tension on face fabrics and encourages water to bead and roll off, making the textile hydrophobic, or water repelling. Once washed, remove your garment from the machine and shake off excess water. Close all zippers. Hang the damp garment and spray DWR evenly on the wet face fabric of the garment, concentrating on high-wear areas. Next, place the garment in a tumble drier on a medium heat setting (40°C / 104°F) for 40 to 50 minutes. We do not recommend using a wash-in DWR. Before drying, turn the garment inside out for maximum uptake by the face fabric. Down relies on air between its clusters to retain warmth. When the face fabric of your garment becomes dirty, body oils and dirt attract water which can then transfer into the down, causing it to clump. Without the pockets of air between the down clusters, the garment loses its insulation value. Down is best washed only as necessary. To maintain performance, wash your garment when it shows signs of dirt or sweat, or the down is starting to lose loft or clump. Front load washing machines are recommended; however, if you have a washing machine with an agitator (top loader), putting your garment inside a mesh bag will help protect it. Put your garment in the machine, add cleaning agent and wash on medium heat (40°C/104°F) at permanent press or gentle cycle settings. If the face fabric of your garment no longer beads water, even after it has been washed and dried, it is time to re-apply DWR. Remove your garment from the machine and shake off excess water. Close all zippers. Hang it and spray DWR on the face fabric, concentrating on high-wear areas. Turn your garment inside out, lay it on a flat surface and remove excess moisture by gently pressing on it with a clean towel. Place your garment in the dryer on low heat (permanent press cycle) with two “dryer balls” or clean tennis balls to prevent the down from clumping and to help it regain its loft. It will be necessary to periodically turn your garment inside out throughout the cycle to help it dry properly. Down must be completely dried before storing to avoid clumping or mold. Be prepared for the process to take upwards of three hours. Arc'teryx gloves are constructed using a variety of materials and fabrics, and patterned uniquely to provide the perfect combination of dexterity and warmth. Arc'teryx premium quality Lezanova leather "dries softly" maintaining suppleness as it dries. We strongly suggest that you keep gloves and mitts at a safe distance (at least one metre) from direct heat sources such as wood stoves, or baseboard heaters. For washing, we recommend that you hand wash your gloves or mitts with a mild detergent in warm water, and then hang to dry. Do not use a washing machine, tumble dryer or any type of wash-in treatments. Removable liners should also be hand-washed and dried separately. Both the outer shells and the glove liners should NOT be turned inside out. After washing close all zippers, hang the wet garment on a hanger and spray Fibertec Blue Guard Spray-On or ReviveX® Spray-On Water Repellent evenly onto the wet face fabric of the garment. Next, place the garment in a tumble drier on a medium heat setting (40°C / 104°F) for 40 to 50 minutes. We do NOT recommend using a wash-in DWR as this process does not guarantee an even distribution of the DWR solution across the entire garment. Instead we suggest using a spray-on solution as this can easily be applied directly and evenly to the entire garment. First, wash your garment using Grangers® Performance Wash, Fibertec Pro Wash or ReviveX® Synthetic Fabric Cleaner. Then, use your chosen reproofing product spray directly on to the outer face-fabric of the garment while it is still wet. We do NOT recommend using a wash-in DWR as this process does not guarantee an even distribution of the DWR solution across the entire garment. Instead we suggest using a spray-on solution as this can easily be applied directly and evenly to the entire garment. Tumble dry your garment inside out on a warm/medium (60°C / 140°F) temperature setting for approximately 30-40 minutes or until dry. Machine wash in lukewarm water and tumble dry at a low temperature. Do not bleach; avoid use of fabric softeners, do not iron or dry clean. For best results, launder garment with like-colours. For the optimal performance, throw your fleece garment in the washing machine when you wash your GORE-TEX® jacket using Grangers® Performance Wash, Fibertec Pro Wash or ReviveX® Synthetic Fabric Cleaner. It removes all of the dirt, prevents odour from building up in the fabric and leaves no residue. We strongly recommend dry cleaning your woolen products, however in most cases, you may hand-wash your woolen garments in cold water using a special soap such as Zero/Woolite, then lay flat to dry. The best way to wash your footwear is simply with water. You can either rub the dirt off with your hands or else you can scrub the footwear with a soft brush. You should be able to get most of the dirt off this way. If you feel that you need to use soap, use a mild or pure soap and rinse the footwear thoroughly to remove any residue. Leave the footwear to dry (don't use a dryer or any other source of heat). If you leave the footwear outside, leave them in the shade. They should dry overnight, but it might take longer depending on the climate. Footwear liners should be hand-washed only, using a pure, mild soap, or a normal detergent. Do not use bleach, or fabric softeners. Footwear liners should be hung to dry and NOT put in the tumble dryer. The best way to wash your pack is simply with water. You can either rub the dirt off with your hands or else you can scrub the pack with a soft brush. You should be able to get most of the dirt off this way. If you feel that you need to use soap, use a mild or pure soap and rinse the pack thoroughly to remove any residue. Hang the pack to dry (don't use a dryer or any other source of heat). If you hang the pack outside, leave it in the shade. It should dry overnight, but it might take longer depending on the climate. All Arc'teryx Naos AC² packs feature our rotating Load Transfer Disc, all of which are pre-lubricated in our factory. Under normal (mild to moderate) use, the Disc will not require any maintenance, however, after prolonged use or exposure to surface contaminants such as sand, mud, or brush, it may need simple cleaning or lubricating. If you hear any noises or experience a reduction in the smooth rotational movement of the hipbelt, you can simply remove the hipbelt and clean the Discs. Remove hipbelt by loosening off side load stabilizer straps and un-thread from plastic buckles on pack body. Take note of the hipbelt orientation for re-assembly. Lay pack on its front upon a level surface and rotate hipbelt 1/4 turn counter-clockwise until Discs disengage with a small 'pop', and separate easily with minimal resistance. Once removed, wipe both Discs with a clean dry rag until debris is removed. If enough lubricant is remaining, re-install the hipbelt to the pack body (see re-assembly instructions below). Lay pack body on its front upon a level surface and lay the hipbelt in its final position, with the ends curving towards the top of the pack. Turn hipbelt to the left 30 degrees and align the teeth on the Discs. Once aligned, apply firm pressure on the face of the hipbelt to press the Discs firmly together and then rotate clockwise until engaged. Alternately, you can use plumber's silicone grease as a back-up, available at most hardware stores or scuba dive shops. Do not use oil based lubricants such as WD40, as it will cause the Discs to seize and degrade the urethane components. To remove gum or sap from a garment, first freeze the substance with some ice, then use a dull butter knife to scrape off as much as you can. Soak the garment in a water/white vinegar solution, and then either wash it in warm water with mild powder laundry detergent or with a cleaner specifically designed for cleaning synthetic garments, such as Grangers® Performance Wash, Fibertec Pro Wash or ReviveX® Synthetic Fabric Cleaner. For really stubborn stains, brush with a soft bristle brush, like an old toothbrush, using Grangers® Performance Wash, Fibertec Pro Wash or ReviveX® Synthetic Fabric Cleaner diluted with 3 parts water. To remove grease from a GORE-TEX® garment, you should dampen the stain and then rub the stained area with Grangers® Performance Wash, Fibertec Pro Wash or ReviveX® Synthetic Fabric Cleaner diluted with 3 parts water (dishwashing detergent can also be used with fair results). You can then clean the jacket in warm water, again using the Grangers® Performance Wash, Fibertec Pro Wash or ReviveX® Synthetic Fabric Cleaner (see above: "How do I wash my GORE-TEX® jacket?"). If the stain persists, you can use Grangers® Performance Wash, Fibertec Pro Wash or ReviveX® Synthetic Fabric Cleaner or sponge it with a safe cleaning fluid which can be found at a grocery store. If cleaning fluid is used, the DWR will need to be reapplied. A cleaning agent that increases the ability of water to penetrate fabric and break down grease and dirt. Detergents contain surfactants or wetting agents which work to reduce the surface tension of the water allowing it to surround particles of grease and dirt, making them more easily removed. It's very difficult to fully rinse detergent from a garment. The wetting agents in any residual detergent on the fabric may impede the function of the DWR by reducing water's surface tension and allowing it to enter into the fabric. For this reason, if using a detergent soap, we recommend a second rinse cycle to more completely remove any residual detergent. A surfactant ("surface-active agent") is a chemical that stabilizes mixtures of oil and water by reducing the surface tension at the interface between the oil and water molecules. Surfactants are designed to produce the opposite effect of DWR's. By reducing the surface tension of water they allow it to be more easily drawn into fabrics. Having an affinity for water; readily absorbing or dissolving in water. Water attracting. Having a resistance towards water, water repellent. Water repelling. DWR formulations have changed in recent years in response to health and environmental concerns relating to a chemical contaminant known as PFOA. In 2014 Arc’teryx fully adopted a new generation of DWR formulations that limit the presence of PFOA. As a result of this change, more frequent washing and re-application of DWR may be required to achieve the same level of performance. For more information, see on our website:“Sustainability: The Long Run”. If the fabric becomes saturated due to an absence of DWR, called wetting out, the garment's perceived breathability is reduced. DWR is not permanent. Both wear and washing will reduce the effectiveness of the DWR treatment on the surface of the fabric. This is most common on the shoulders and upper back due to friction produced by wearing backpacks. There is enough DWR present on the fabric when water beads up and runs off the fabric. Wetting out refers to the face fabric becoming saturated with moisture, leading to compromised breathability and increased condensation, making you feel wet and clammy. With GORE-TEX® garments, even if the face fabric is wetting out, the waterproof membrane will still stop any water from passing through. Wetting out occurs when DWR stops working or wears off. Natural degradation over the lifetime of the garment will affect how long each application of DWR will last. DWR also wears off during normal use, most commonly in high-wear areas such as the back, shoulders and cuffs. Exposure to smoke or contaminants will also compromise DWR. Contamination occurs when materials such as dirt, sunscreen, bug spray, body oil, and sweat penetrate the face fabric (outer surface) or backer (inner surface) of a garment. It can be a cause of fabric breakdown, decrease the lifespan of technical garments, and will compromise DWR effectiveness.